This agreement provides a very thorough framework for the shareholders of any private company to set out the precise structural management of their business. It covers the provisions that will be important to owners of most private limited companies. 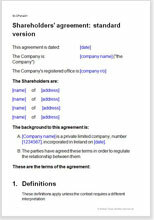 A shareholders’ agreement is an essential document for the owners of any company. It rebalances control when there is different levels of involvement and power in day to day decisions, and protects the value and the interests of each party. Not only should this template help you establish the strategic management structure you need to grow your business, but also ensure that your investment is protected when you or other owners decide to sell. This template is our full standard version, suitable for most private limited companies regardless of the industry of the business or the number of shareholders. It could be put in place by a majority or a minority shareholder when the company is formed, or at any later time, for example, on change of ownership or when a significant debt investment is made or repaid. No other shareholders’ agreements for sale on the Internet are so comprehensive in their cover of legal issues, and the drafting explanations and tips supplied. This agreement has been carefully thought out and frequently updated over 15 years so as to give you a document that covers the law accurately but which, at the same time, helps you to avoid conflict in day to day practical areas of management and control. Each provision is clearly worded and can easily be edited or removed without affecting the remainder of the document. facility for a minority shareholder to appoint his or her own nominated director who cannot be removed by the others. We also offer other versions of this agreement for specific situations. including where a single person owns the majority of the equity, and where shareholders include professional investors who require more complex exit provisions. "An invaluable service to have at your fingertips and a must have website for any small business owner to have in their favorites."